Prototype version of the Wyatt Earp Target Stand. Prototypes may be production stands that have cosmetic defects or be out-of-spec. These stands are 100% fully-functional target stands. They are either prototypes that were used during initial design and testing, production units that did not pass our strict quality control metrics or obsolete models. These stands are not covered under any Target Meister guarantee or warranty. However, you can be confident that they will not fail under reasonable use. Also, there is no guarantee that you will get a specific stand with a particular defect and/or feature. For instance, some stands employ our auto-seizing braces (below right); others do not (below left). You get what we send. Finally, there is no guarantee of availability. Obviously, we do not keep these stands in stock. They are only made available when we have them. Usually these stands are trashed or cut down into scrap metal. I figured nobody wants our prototypes and less than perfect stands. [[IMG products/wyatt_earp_target_stands_prototypes-2.jpg alt="painted prototypes" class="float_l"]] However, one day I received an email from a customer who purchased a Dirty Harry target stand. He really liked it and wanted another stand, but said he was short on funds and would have to save up. I replied, asking if he was interested in our prototype stands "for cheap"? He answered, "I would be interested in your prototypes. The words 'for cheap' are always an attention-getter." That conversation prompted me to make our non-production stands available. Selling our prototype and out-of-spec stands is a way for us to reduce our waste and overhead. 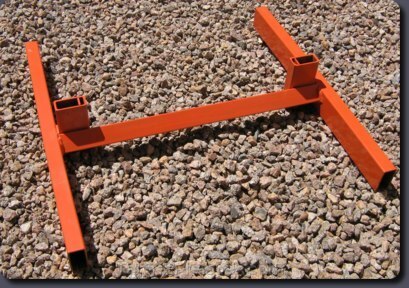 It is also an opportunity for some customers to get their hands on a fully-functional target stand at a great value.